More genius ideas at Moss, this time...clocks. Again, they are pricey, but so fantastically designed they deserved a separate post. Graphic designers are going to love this. 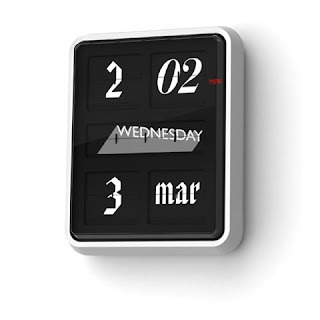 The Font Clock is a flip clock with a variety of typefaces which create an ever-changing display. A total of twelve different fonts are used for the time and date display. The large display is $1,900.00, but you could opt for the smaller one at $450.00. Good design is expensive! This clock is pure fun for the world traveler in you. The World Time Clock has 12 sides, each with the name of two major cities. Altogether, the 24 cities represent the 24 Global Time Zones. 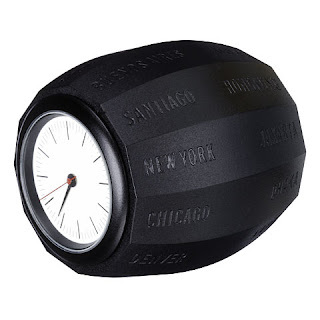 To find the local time in another time zone, roll the clock so the city representing that time zone is on top. Still pricey at $75.00, but you got to admit...it is pretty cool. See more Moss designs here.